Why Liaison Office backs Lam? Chief executive contender Carrie Lam Cheng Yuet-ngor, who is seen as the best person to carry on Leung Chun-ying's policy, receives full backing from the Central Government's Liaison Office. The Central Government’s Liaison Office in Hong Kong has left no stone unturned to boost the chance of Carrie Lam Cheng Yuet-ngor in the chief executive race, triggering a public outcry in the society. The Liaison Office even dared to bluff Election Committee (EC) members by pretending it is really representing Beijing. They intimidated candidates who might pose a challenge against Mrs Lam. One ridiculous theory being floated is that “those who do not vote for Carrie Lam (are deemed as) opposing Beijing.” The Liaison Office has issued an order for soliciting 700 nominations, out of 1,194 EC members, for Mrs Lam. The move effectively means Hong Kong’s chief executive will be anointed by the Liaison Office. This is a phenomenon worth people’s attention. First, we must clearly understand the Liaison Office absolutely cannot represent the central authorities. The most concrete evidence is that the Liaison Office had been completely left out of the loop over the issue of Leung Chun-ying not seeking re-election. In an article published in the Hong Kong Economic Journal 8 December 2016, I presented three pieces of evidence that show “Beijing is moving towards the direction of ‘abandoning Leung’.” On the same day, a friend from the leftist camp asked the Liaison Office whether my article was true. A vice-departmental-grade official told my friend “not to believe in rumours,” stressing that “Beijing’s attitude is clear: Beijing will support Leung for a second term.” Ond day later, Leung announced his decision not to run. This clearly illustrates that not only the Liaison Office does not represent Beijing, they are completely out of touch over such big issues as chief executive election. Liaison Office director Zhang Xiaoming (on left of Leung) is a strong supporter of Chief Executive Leung Chun-ying. The two examples fully show the Liaison Office does not represent Beijing, nor they really understand Beijing’s intention. I, therefore, would urge EC members to ignore the pressure from the Liaison Office to avoid having to make a U-turn later. Secondly, we should be alert to the question of why the Liaison Office spares no effort to support Mrs Lam. Among the four hopefuls (now five with Leung Kwok-hung joining the bid), Mrs Lam best represents C Y Leung’s policy direction. She made that clear when she announced her candidacy. Therefore, supporting Carrie Lam means supporting CY Leung’s policy direction. Why does the Liaison Office feel it has to continue CY Leung’s direction? This is because Leung has successfully made “Liaison Office running Hong Kong” and “filling up the ruling team with pople from the leftwing camp” normal in the past five years. When Leung was elected in March 2012, I predicted he would precipitate four major crises. They are: “two systems” moving closer towards “one country”, the “mainlandisation” of the government’s ideology; the normalisation of “Liaison Office running Hong Kong” and “filling up the ruling team with people from the leftist camp. (See article on HKEJ website on 19 April 2012). Events in the past five years proved my observation is correct. Since Leung has successfully allowed the Liaison Office to “participate”, or indeed interfere, in the internal affairs of Hong Kong and appointed a lot of people from the leftist camp, the Liaison Office has incentives to support Leung’s re-election bid. Now that Leung drops his election bid, Mrs Lam, who supports Leung’s policy direction, will be chosen to carry on the task. Third, the so-called “fight for regime change” is ridiculous. In order to install Mrs Lam onto the top post, the Liaison Office even publicised through pro-Beijing media the notion of so-called “regime change” as raised in a column published in the Headline Daily on 17 January 2017. The article argued that choosing Mrs Lam means protecting or defending Hong Kong’s regime and voting for others a loss of governing power. This is ridiculous. First, a CE election supposedly conducted in accordance with the Basic Law is being exaggerated to become a “fight for regime change.” Why the Basic Law stipulates to have such an election in the first place? Second, Hong Kong and Macau Affairs Office director Wang Guangya has said the pan-democratic camp is part of the political establishment. Beijing has decided to re-issue home visit permits to pan-democratic lawmakers. So even if one wins the CE election with support from pan-democrats, that only means they get support from different political spectrum in the pro-establishment camp. How come it is seen as a “fight for regime change?” Those who are being influenced by the Liaison Office have lost their ability to tell the right from the wrong. I feel something unusual when I found the Liaison Office and its underlings were trying to escalate a normal CE election into a “fight for regime change”. 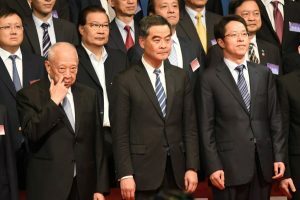 Prolonging Leung’s policies can help normalise the practice of “Liaison Office running Hong Kong” and “filling up the ruling team with people from the leftwing camp.” On top of that, there may be a more deep-seated reason: the Liaison Office intends to put an obedient person in the top job in order to protect the interests of certain people and their respective factions in Hong Kong. This is the key. My suspicion is not groundless in view of several incidents in the past few years. Former chief secretary (CS) Rafael Hui Si-yan was involved in a corruption case. It was revealed former HKMAO director Liao Hui (廖暉) had arranged to provide a sum of $10 million to Hui for him to solve his debt problem so that he could join the government, but not the private sector. This might sound his one-side story. But I believe this is true because these statements were made by Hui in court. If they were fabricated, he would be charged with perjury and Liao, who would be framed in this scenario, would surely deny. I believe that no one would dare to frame a ministerial-level official from central authorities. There are two questions then. Why Liao has to help Hui (in other words, why must Hui become CS to the point Hui has to be helped with such an extraordinary arrangement? Where did Liao’s $10 million come from (in other words, how did Liao pay this sum of money to Hui)? This unreasonable phenomenon only renders one reasonable explanation: putting Hui in the position of CS will help Liao Hui protect the interests of his family or his factions in Hong Kong. What are the lessons from Hui case? In order to achieve their goals or objectives, some people might violate the normal employment terms of civil servants and put obedient people in key seats of the HKSAR government (since Hui took the “financial aid,” he will surely be obedient). In fact, the $10 million sum already constitutes a bribe to Hui, so how can Hui not repay his benefactor when he becomes CS? The former chairman of China Resources Group, Song Lin, was charged in Guangzhou on 8 December 2016. Song Lin’s corruption case was already reported by Li Jianjun, a journalist from Shanxi Evening Post, to ICAC and the Commercial Crime Bureau (CCB) of the Hong Kong Police. But it was later discovered that someone from the mainland authorities contacted ICAC through the Liaison Office, saying that the case involves mainland China and hoped that ICAC would not interfere. According to Li Jianjun, it was a matter of fact some deeds of misconduct took place in Hong Kong and Macau. As China Resources Power is listed in Hong Kong, the law enforcement agencies of Hong Kong are therefore held responsible for investigating this matter. ICAC and CCB did not do anything and did not handle this report. It is universally known that Song Lin is a “super fan” of CY Leung. He was president of the Hong Kong Chinese Enterprises Association. The association had sixteen votes in the 2012 CE election. 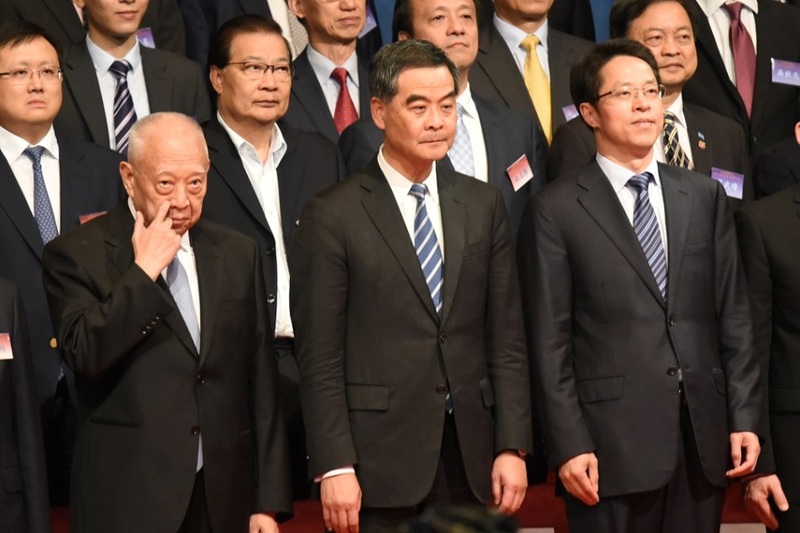 All went to Leung’s pocket. One year after Leung was elected, Song Lin was immediately appointed as a Justice of Peace and holds various public posts, including a member of the Economic Development Commission and chairman of the Hong Kong Business Ethics Development Advisory Committee (HKBEADC) under ICAC. These acts were criticised as political rewards. How can ICAC receive a report and do nothing at all? I speculate that this may be because ICAC was scared of Song Lin, who holds the title of chairman of HKBEADC. The ICAC will become a laughing stock if they take Song to court. The cases show whether or not the CE is obedient is very important. If the CE is obedient enough like Leung, ICAC would not interfere. Economic Information Daily’s chief journalist Wang Wenzhi reported to the Central Commission for Discipline Inspection (CCDI) about Song Lin on 15 April 2014, along with the photos taken with Song and his mistress together. If that was not reported, Song is probably off scot-free. The lesson to learn from the Song Lin case is that whether or not a CE is obedient is very important to the interests of various factions of the Communist Party in Hong Kong. The case of tycoon Xiao Jianhua is definitely the most shocking news in the political field recently. Xiao, who helped handle more than HK$1 trillion-worth assets for senior officials on the mainland, was “brought back to China”. The truth behind the incident is yet to be ascertained. But the case exposed an organisation founded in 2014, known as the Hong Kong Association of Cultural Industries (HKACI). Xiao is a vice president of HKACI, whose honorary sponsor is CY Leung. The chairman of the HKACI Executive Council is Peter Lam Kin-ngok. Other directors include Henry Cheng Kar-shun (chairman of New World Development), Robert Ng (chairman of Sino Land), Albert Yeung (chairman of Emperor Group), Charles Ho Tsu-kwok (chairman of Sing Tao Group) and Vicki Zhao (a famous Chinese actress). These facts are worth noting for two reasons: It was unconventional before 1997 for the Governor to hold a post in an organisation with complicated political and commercial ties. Under normal circumstances, this would amount to the CE serving as protection and a promotional tool for this organisation. However, this case may involve the top tier, so the CE can do nothing. Second, many of the directors of the organisation joined Carrie Lam’s election office. What is the lesson to learn from the Xiao case? Giving Carrie Lam the top post would help strengthen the status and protect the interests of this interest bloc in Hong Kong. However, this bloc has offended the top tier due to unknown reasons to a point even Leung cannot offer the protection needed. The nature of this case is different from the other three. However, this case clearly illustrates the direct connection between whether a CE is obedient or not, and the people whose interests the mainland would like to protect. This case, which was concluded in October 2016, showed that a Chief Li and a Chief Zhang (no full name given) from the United Front Work Department (UFWD) of the CCP had an appointment with online radio host Anthony Cheng through Peggy Gao, a member of the then CE election office of CY Leung. Cheng was asked to reach out to localists and lure them into contesting about 40 District Council constituencies designated by the UFWD. The objectives of this was to split the votes of pan-democratic candidates and to ensure the “iron-clad votes” of the pro-Beijing candidates. Those localists who accept the offer and contest would get $150,000 per person, regardless of whether they win or lose. If those bribed localists were to challenge incumbent District Council and Legislative Council members, they could even get $250,000. But the condition would be to get 200 votes. We know that the maximum amount of election expenses prescribed by law in DC elections is $48,000. The UFWD’s offer is more than three times the prescribed amount. The intention of the attempted bribery is very clear. Hong Kong Indigenous and Youngspiration, two groups advocating independence, were among the localist organisations that were solicited by the UFWD. What are the lessons learned? Some people oppose “pro-independence” activists superficially but support them behind the scenes. The only explanation of their self-contradictory stance is that the louder the voices of separatists, the greater the evidence that national security is under threat and therefore more money is needed for maintaining stability (weiwen 維穩). At the same time, their hardline approach in Hong Kong will be endorsed by their superiors in Hong Kong. Put simply, it is a tactic that creates non-existent “danger” that aims to consolidate their own political status here. Ching Cheong is a veteran journalists. He writes regularly on Greater China issues. Be the first to comment on "Why Liaison Office backs Lam?"